The latest results from the Nebraska Tractor Test Lab show that Case IH Steiger® tractors with Selective Catalytic Reduction (SCR) technology have set new industry records for fuel-efficient power. So you don't have to sacrifice productivity to meet new emissions regulations or settle for less fuel efficiency to get more power. That's because these tractors have been engineered for Efficient Power with knowledge gained by talking to producers in the field. We've worked with producers like you to find unique solutions to cover more acres in a day, keep you in the field as long as you need and even give you a more comfortable, intuitive cab. 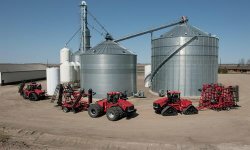 The Steiger 370, 420 and 470 maintain the heavier, thicker steel frame with the larger wheel base of the larger Steiger tractors, but are built with a narrower frame width for row-crop farmers. 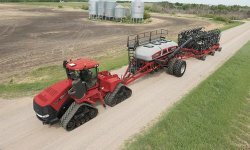 Available on the Steiger 370, 420 470, 500, 540, 580 and 620, the Steiger Quadtrac® has four individually driven, oscillating tracks that reduce compaction and provides better floatation and traction in the field. The Case IH Steiger Series tractors are powerful, reliable, fuel-efficient, and easy to maintain - allowing prodcers to be ready. 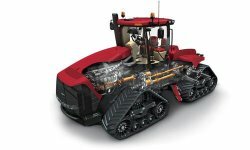 No reviews were found for Case IH Steiger - Model Steiger and Quadtrac range - Tractors. Be the first to review!